AIM AND BACKGROUND: Given the fact that immune system is greatly affected by people's emotional characteristics and since these characteristics are mainly formed through interactions with one's parents, this study aims to determine the relation between personality characteristics and disorders of multiple sclerosis (MS) patients and their parents. METHODS: This is an applied, descriptive study on 88 MS patients and 63 parents who had visited two physiotherapy clinics in Tehran between January and August 2016. Participants who met the inclusion criteria were selected using convenient sampling method. After acquiring their consent, participants were asked to fill the millon personality questionnaire. Gathered data were analyzed using Pearson and Spearman tests. R statistical software was also used to draw histogram of the data. RESULTS: The most common personality disorder in MS patients includes histrionic personality disorder while the most common problems among their parents included histrionic personality disorder and obsessive character traits. There was also a direct, significant relation between histrionic personality disorder and narcissistic traits in parents and patients. CONCLUSIONS: Due to unknown nature and progress of MS, studying personality characteristics of patients and their parents can help determine better treatment methods along with advances in neurological treatments. Multiple sclerosis (MS) is one of the most common neurological disorders with around 2 million patients worldwide., In Iran, out of every 1000 people, 15–30 people suffer from MS. The importance of this disorder in psychology is due to its wide range of psychological and neurological effects with studies showing 5% of MS patients suffering from acute psychological disorders. Studies regarding psychological dimensions of neurological disorders generally focus on cognitive and neurophysiological changes and rarely investigate psychological disorders in these patients. Stress and negative emotions are among factors which accelerate the progression of MS. This effect is so important that treatment plans usually emphasis stress management as much as medication. On the other hand, our immune system is affected by attitudes, emotions, coping mechanisms, and other personal and interpersonal characteristics. Therefore, it appears that personality can be among factors affecting the quality of life in MS patients. From a generalized perspective, the abnormal response of body's immune system in MS is accompanied with abnormal psychological responses. In other words, based on the integrity between body and mind functions, MS patients must have self-critical tendencies and specific characteristics at the psychological level. Various studies have shown that stressful lifestyles are related to MS. Studies have also shown a correlation between bipolar disorder and MS. Bipolar symptoms might occur before neurological symptoms of MS, and some reports even show that MS can be seen as mania. Changes in emotions and personality have also been reported along with MS with significant differences being observed between MS patients and control groups.,, Currently, various studies emphasize the important role of personality in clinical neurology. Regarding personal characteristics, studies have shown that MS patients are different from healthy individuals in some personality characteristic. MS patients show higher amounts of neuroticism and lower level of conscious., Regarding psychological and personality disorders, to this day no studies have been conducted on sufficiently large number of participants. However, one study has shown clear abnormalities, especially regarding personality characteristics. Another study showed some personality characteristics being intensified or inhibited by MS with some going as far as becoming personality disorders. In another study, the results showed a significant difference between MS patients and healthy individuals in the prevalence of aggressive-passive personality disorder, avoidance, and borderline personality disorder. In general, it appears that psychological disorders can greatly affect various aspects of MS patients' lives. Due to chronic nature of this condition and its various disabling symptoms, it is often accompanied with several psychological and mental disorders affecting patients at emotional and personality levels. On the other hand, different personality characteristics can lead to different neurological outcomes while changes in central nervous system can also lead to changes in personality. Therefore, it can be concluded that psychological symptoms are not only effective in creating MS but can also be used for its treatment. Some studies have shown that some psychological disorders are more prevalent among biological relatives of MS patients which can be evidence of genetic factors. Relevant literature also mentioned childcare styles and personality characteristics of parents. Therefore, it can be said that parents can create certain personality characteristics in their children through both genetics and their childcare style. However, to this day, no study has investigated personality disorders in MS patients in Iran and their relation to personality characteristics of patients' biological relatives. Personality characteristics and disorders can account for a part of various findings based on the measuring methods used. As a result, given the fact that personality characteristics of biological relatives, especially parents are one of the factors affecting mental health and interpersonal relations in people  and since personality characteristics of parents of MS patients (as main caregivers) can be among stressor factors, the current study aims to determine the relation between personality disorders and characteristics of MS patients and that of their parents. This is a correlation study with applied aim. Sample size was determined using Cochran equation to be 88 individuals. Participants were customers visiting two physiotherapy centers in Tehran for treatment between January and August 2016 who met the inclusion criteria and were selected using convenient sampling. To achieve the study's aims, parents of the patients were also asked to participate in the study. This resulted in participation of 63 parents. Inclusion criteria included definitive diagnosis of MS by a neurologist specialist (patients were introduced to physiotherapy center and clinical psychologist in a letter from the specialist and fellowship); minimum age of 18 years, lack of pregnancy, minimum of eight grades of education, at least 6 months being passed since diagnosis, no experience of acute or chronic stress in the last 6 months (which was determined through interview with clinical psychologist and questions regarding loss of close relatives or other hard or traumatizing experiences), and personal consent for participating the in the study. Comparison of personality disorders led to various correlations from 0.58 to 0.93 with average of 0.78. Other studies in Iran indicate good reliability of this questionnaire. For example, in a study by Sharifi, the correlation of scores between first test and retest was reported in the range of 0.82 (delusional disorder) to 0.98 (schizotypal personality disorder). In the implementation phase, the main goal and important role of participants were explained. Then, after acquiring the verbal consent of patients, each individual patient was asked to fill Million 3 questionnaire provided by the researcher. For patients who were unable to personally fill the questionnaire due to disabilities, items were read to then without any directions, and their exact answers were recorded. Since this test was a personality test, to reduce participants resistance, they were assured that their answers will remain confidential. After gathering the questionnaires, data were entered in SPSS software package V.18 (California, USA). Description of variables was carried out using average and standard deviation. Normality of variables of patients and their parents scores was investigated. Then, Pearson and Spearman correlation tests were used for normal and nonnormal scores, respectively. R statistical software was used to draw profile chart of patient and parent personalities. R is one of the most common software for statistical analysis, which is free of charge. A total of 69.3% of patients were female, 34.1% were married, and 54.5% had associate or bachelor degrees. The majority of participants were between 17 and 58 years (33.03 ± 9.032). The duration of MS condition was between 5 months to 23 years (7.57 ± 5.396) for the majority of participants. To better investigate personality disorders in patients, simultaneity of various disorders was investigated. Among 88 patients, 47.7% (42 patients) had no personality disorders. Nearly 34.1% (30 patients) had only one disorder, 12.5% (11 patients) had two simultaneous disorders, 3.4% (3 patients) had three simultaneous disorders, and 2.3% (2 patients) had four simultaneous disorders. 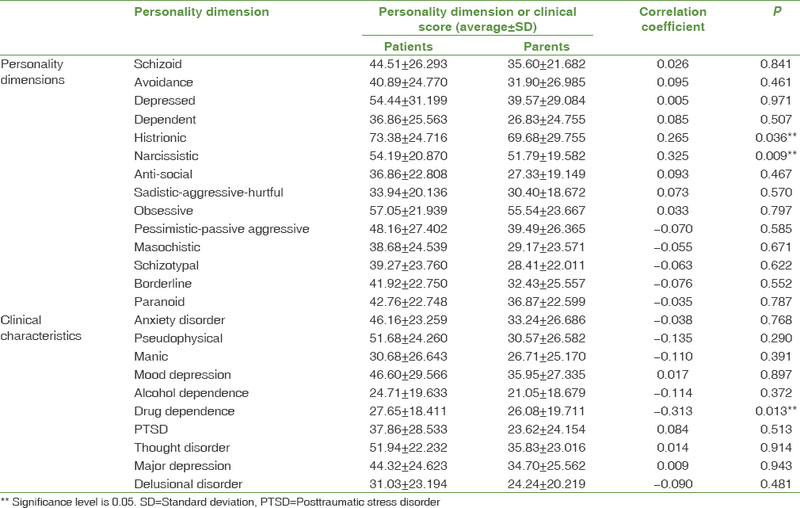 [Table 1] shows average and standard deviation of personality dimensions as well as frequency of personality disorders and characteristics in patients. Histrionic disorder with frequency of 28.4% was the most common personality disorder among patients; with depression being the next frequent disorder with frequency of 12.5%. Histrionic dimension was also the most common personality dimension with the frequency of 28.4% with the next common personality dimension among patients being Narcissistic dimension with the frequency of 18.2%. Among 88 participating patients, the parents of only 63 patients participated in the study. The following section investigates the correlation between personality characteristics and disorders of patients and that of their parents. About 50.8% of parents participating in the study were mother of the patients. Parents were in the age range of 46–69 years (average of 59.40 and standard deviation of 6.031). Average and standard deviation of each personality dimension and disorder as well as the number of individuals with each dimension and disorder are shown in [Table 1]. The personality profile chart for 24 scales of the questionnaire was drawn based on average scores of MS patients and their parents[Figure 1]. [Table 2] shows the average and standard deviation of each personality dimension and clinical characteristics and also correlation coefficient between the scores of 63 patients and their parents. Due to lack of normality, Spearman correlation coefficient was calculated. According to the results presented in [Table 2], there is a direct and significant correlation between histrionic scores of patients and their parents. There is also a direct and significant relation between scores of narcissistic dimensions in patients and their parents. However, neither of these correlation coefficients show a strong correlation. In case of clinical characteristics, there is only an inverse and significant relation between drug dependence in patients and their parents. The results of the current study showed that the most prevalent personality disorders based on average scores of millon questionnaire were histrionic and depression, while the most common personality characteristics were histrionic and narcissistic personalities. These results were different from those reported in the study by Mirzaei et al. Investigating literature on causes of personality disorders shows that people with histrionic personalities have strict fathers and histrionic mothers. The results of the current study are in agreement with this causation because the most common disorders and characteristics in parents were determined to be histrionic and obsessive personalities. Furthermore, theoretical principals state that these results cannot be the result of a single cause which is due to correlated and multivariable nature of personality disorders (which include psychological, medical, and physical factors). In regards to personality characteristics, studies have shown that these people are different from normal people in some personality characteristics. Except in one case, the majority of studies regarding personality characteristics of MS patients have used Neo's five-factor questionnaire while other studies have determined the relation between some factors of this questionnaire and a number of personality disorders. Some studies have shown that MS patients have higher extraversion and openness and lower agreeability compared to normal people.,,, In a number of studies on people with histrionic personality, these people scored higher in openness and extraversion and lower in agreeability and responsibility in the five-factor questionnaire. Other than histrionic personality, the agreeability factor in Neo's questionnaire has a good correlation with narcissistic personality disorder in a way that people with lower agreeability scores in Neo's questionnaire, had higher scores in narcissistic personality. This is similar with the result of the current study which showed that the most common personality disorders among MS patients were histrionic and narcissistic disorders. There is no exact data regarding the reason for formation of histrionic personality; however, it appears that people with histrionic personality have a family history of histrionic personality and that genetics and education affect the formation of this personality disorder. The reason is that children receive attention and acceptance when following the behaviors of their parents. It also appears that people with histrionic personality have received unpredictable attention as children and that this personality disorder affects the method people use for dealing with stress. Previous results in this regard were somewhat contradictory. For example, some studies showed that no difference between MS patients and control group regarding of personality characteristics  while others showed a significant difference. The result of the current study showed that the diagnosis of MS alone is not enough for creating meaningful changes in patients' personalities, but it is possible for people with personality disorders to experience personality changes. One reason for this can be the fact that different forms of parenting which are a mixture of parents' behaviors and occur in different conditions lead to different levels of stability in children. This means that personality characteristics of parents can affect their parenting methods. Furthermore, psychologists believe that various factors affect the formation of any phenomenon, all of which must be investigated. The results of the current study were not in agreement with results reported by Mirzaei et al. Their results showed that the majority of MS patients suffer from avoidance personality disorder. One important difference between these two studies is that Mirzaei et al. selected their sample from neurologist's office while we selected participants from physiotherapy clinics. This means that our participants had volunteered for physiotherapy after diagnosis and were attending physiotherapy sessions on their own which can be important for the results. The reason is that physiotherapy environment requires a high level of commitment and cooperation of MS patients during treatment which means that these types of activities involving physical activities, talking to others, and being seen might not be easy for people with avoidance personality disorder. This means that the result of our study might compliment the results reported by Mirzaei et al., while also indicating that personality characteristics might act as barriers during treatment. Despite the prevalence of lack of exercise in MS patients, recent studies have shown that therapeutic exercises and physiotherapy can be important in reducing the symptoms of MS. Furthermore, therapeutic exercises can help MS patients to improve their physical abilities which have degraded due to their condition. The participants in our study were selected among MS patients who were participating in therapeutic exercises and physiotherapy in a related clinic. Since no comparison was made between these patients and healthy individuals, the results might not contradict the results reported by Mirzaei et al. In other words, these results only show that personality characteristics are correlated to following treatment (physiotherapy) plans which can help reduce symptoms in patients. Therefore, it is necessary for psychological studies to be conducted in the area of physiotherapy to determine personality characteristics which inhibit participation in and following the treatment plan. Otherwise, some patients will not fully follow-up their treatment plans due to personality problems. Histrionic disorder was the most common personality disorder among the parents of MS patients while the most common personality characteristic was obsessive personality. Since environmental stressors have an important role in MS, histrionic personality disorder in parents leads to obsessive preoccupation with outside phenomena, thus creating an empty shell. In other words, limiting the emotions and cognitions of daily life due to this disorder leads to loss of opportunities for learning new behaviors and self-improvement. This limiting of learning opportunities means that people get stuck in a cycle of dependence on others and these numerous deprivations sometime lead to emotional disorders. Based on the desire of histrionic individuals for communication with others and their ambitious nature, it is possible for these individuals to suffer from chronic disorders. Furthermore, based on childhood experiences, children of these parents attempt to fine methods to reduce feelings of dissatisfaction, worthlessness, and nonacceptance. One of these methods is for these individuals to attempt self-consultation, believing themselves to be valuable and talented individuals. The final product of this process is people without self-esteem regarding their abilities who constantly seek attention and acceptance. One of the mentioned causes for histrionic personality is a strict father and a histrionic mother which can, along with other factors, lead to histrionic personality in their children. The reward people with histrionic personality receive for roleplaying instead of effectiveness means that they will always play a role and never attempt to expand their abilities. This also means that when faced with problems, these people attempt deceit instead of a brave response. Since participants showed good cooperation during interviews, they had a long history of self-made hurt and use of emotional tools. They also frequency use denial defense mechanism against negative emotions such as fear and anger and sexual desires. In regards to the correlation between histrionic and Narcissistic personality patterns between patients and their parents, it is possible for these patterns to have been transferred to patients through their parents' parenting methods. The relevant literature mentions the relation between parenting method and personality characteristics of parents. Therefore, it can be said that parents facilitate the formation of certain personality patterns in their children through their personality characteristics and genetic background of their children. Studies have also shown that similar psychological disorders are more prevalent among biological relatives of patients which shows the effectiveness of genetic factors. MS can also be the reason for intensification of the symptoms of these personality disorders. The current study showed that the highest scores belonged to histrionic personality characteristic and disorder in MS patients and histrionic personality disorder and obsessive characteristic in their parents. There was also a correlation between histrionic and narcissistic personality dimensions of patients and their parents. Studying the personality patterns of patients and their parents can help better identify the problems and facilitate treatment. These results also have implications for education and improvement of mental health in MS patients. This helps the families of these patients to better adapt to their society and environment and reduces the changes of psychological conditions and disorders. The results of the current study can be used by physicians and consolers in various treatment centers. Knowing these effects also helps parents and caregivers of MS patients to better understand their interactions and enables them to provide better and more empathic care for patients. This helps parents to better participate in personality management and can improve patients' responses to treatment. It is worth mentioning that answering the questions was difficult for patients due to their weakened physical conditions. This limitation was somewhat fixed with the help of the researcher and by dividing the questions into several parts. One of the advantages of this study was the fact that patients were introduced to the researcher by neurologist specialist and fellowship of psychotherapy center. Given the chronic and long treatment of MS, we suggest that a more comprehensive treatment plant to be used by treatment groups by considering biopsychological aspects of this condition. We would like to thank Dr. Naser Ghasemi, neurologist, MS fellowship, and center's psychologist for their help in introducing patients to this study. We also like to thank all participants including patients and their families for their help in this study. Stuifbergen AK, Blozis SA, Harrison TC, Becker HA. Exercise, functional limitations, and quality of life: A longitudinal study of persons with multiple sclerosis. Arch Phys Med Rehabil 2006;87:935-43. Masoudi R, Mohammadi E, Naboudi M, Ahmadi F. The effect of self-care program based on Orem model on physical aspects of quality of life in patients with multiple sclerosis. J Shahrekord Univ Med Sci 2008;10:21-9. Taraghi Z, Eleiae M. Quality of life of patient member of MS society of Mazandaran. Persian Iran J Neurol 2007;20:51-60. Kaplan Harold L, Sadock Benjamin J. Comprehensive Textbook of Psychiatry. 18th ed. Philadelphia: Wolters Kluwer Health-Lippincott, Williams and Wilkins; 2005. Ozura A, Erdberg P, Sega S. Personality characteristics of multiple sclerosis patients: A Rorschach investigation. Clin Neurol Neurosurg 2010;112:629-32. Khalkhali MR. A case report of a MS patient with bipolar disorder and mood disorders. Uilan Univ Med Sci 2002;11:11-24. Bol Y, Duits AA, Hupperts RM, Vlaeyen JW, Verhey FR. The psychology of fatigue in patients with multiple sclerosis: A review. J Psychosom Res 2009;66:3-11. Harder RK. Personality in multiple sclerosis. J Clin Psychol 1993 (69):890-902. Mohr DC, Hart SL, Julian L, Cox D, Pelletier D. Association between stressful life events and exacerbation in multiple sclerosis: A meta-analysis. BMJ 2004;328:731. Salmaggi A, Eoli M, La Mantia L, Erbetta A. Parallel fluctuations of psychiatric and neurological symptoms in a patient with multiple sclerosis and bipolar affective disorder. Ital J Neurol Sci 1995;16:551-3. Heilä H, Turpeinen P, Erkinjuntti T. Case study: Mania associated with multiple sclerosis. J Am Acad Child Adolesc Psychiatry 1995;34:1591-5. Merkelbach S, König J, Sittinger H. Personality traits in multiple sclerosis (MS) patients with and without fatigue experience. Acta Neurol Scand 2003;107:195-201. Christodoulou C, Deluca J, Johnson SK, Lange G, Gaudino EA, Natelson BH, et al. Examination of Cloninger's basic dimensions of personality in fatiguing illness: Chronic fatigue syndrome and multiple sclerosis. J Psychosom Res 1999;47:597-607. Johnson SK, DeLuca J, Natelson BH. Personality dimensions in the chronic fatigue syndrome: A comparison with multiple sclerosis and depression. J Psychiatr Res 1996;30:9-20. Trull TJ, Widiger TA. Dimensional models of personality: The five-factor model and the DSM-5. Dialogues Clin Neurosci 2013;15:135-46. Abedini M, Montazeri S, Ghorban Shiroudi SH. Comparing the big five personality factor in patients with multiple sclerosis and healthy individuals. J Mazandaran Univ Med Sci 2012;22:35-9. Krishnan KR. Psychiatric and medical comorbidities of bipolar disorder. Psychosom Med 2005;67:1-8. Penner IK, Bechtel N, Raselli C, Stöcklin M, Opwis K, Kappos L, et al. Fatigue in multiple sclerosis: Relation to depression, physical impairment, personality and action control. Mult Scler 2007;13:1161-7. Benedict RH, Priore RL, Miller C, Munschauer F, Jacobs L. Personality disorder in multiple sclerosis correlates with cognitive impairment. J Neuropsychiatry Clin Neurosci 2001;13:70-6. Mirzaei M, Jaryani N, Masafi S, Afsar Aski S, Dolatshahi B, Rezaei B. Identifying the personality patterns in patients with multiple sclerosis (MS). Int J Collab Res Internal Med Public Health 2012;4:1901-11. Noy S, Achiron A, Gabbay U, Barak Y, Rotstein Z, Laor N, et al. A new approach to affective symptoms in relapsing-remitting multiple sclerosis. Compr Psychiatry 1995;36:390-5. Schwartz ES, Chapman BP, Duberstein PR, Weinstock-Guttman B, Benedict RH. The NEO-FFI in multiple sclerosis: Internal consistency, factorial validity, and correspondence between self and informant reports. Assessment 2011;18:39-49. Saulsman LM, Page AC. The five-factor model and personality disorder empirical literature: A meta-analytic review. Clin Psychol Rev 2004;23:1055-85. Pervin LA, Cervone DJ. Personality, Theory and Research. New York: John Wiley and Sons; 2005. p. 250-70. Millon T, Davis RD. An evolutionary theory of personality disorders. In: Clarkin GF, Lenzenweger MF, editors. Magor Theories of Personality Disorder. New York: Guilford Press; 1996. Sharifi AA, Karami A. MCM Guide (Milton 3). Tehran: Ravansanji; 2007. Craig RJ. Overview and current status of the millon clinical multiaxial inventory. J Pers Assess 1999;72:390-406. Sharifi AA. Standardization of Multilateral Clinical Trials of Milton 3 in Isfahan, Master's Degree, (Unpublished), Isfahan University; 2002. Hawkes CH. Are multiple sclerosis patients risk-takers? QJM 2005;98:895-911. Ahmadi P, Mahmoud Allylu S. Comparison of Personality of MS Patients with Healthy Subjects Based on Five Factor Model. 8th International Congress of U.S. Iranians. Mashhad University of Medical Sciences and Health Services; 25-26 October, 2011. Furnham A. A bright side, facet analysis of histrionic personality disorder: The relationship between the HDS colourful factor and the NEO-PI-R facets in a large adult sample. J Soc Psychol 2014;154:527-36. Miller JD, Gaughan ET, Maples J, Price J. A comparison of agreeableness scores from the big five inventory and the NEO PI-R: Consequences for the study of narcissism and psychopathy. Assessment 2011;18:335-9. Lord SE, Wade DT, Halligan PW. A comparison of two physiotherapy treatment approaches to improve walking in multiple sclerosis: A pilot randomized controlled study. Clin Rehabil 1998;12:477-86. Finlayson M, Garcia JD, Cho C. Occupational therapy service use among people aging with multiple sclerosis. Am J Occup Ther 2008;62:320-8. Millon T. Personality-Guided Therapy. Hoboken, NJ, US: John Wiley & Sons Inc: 1999. Lenzenweger MF, Clarkin JF. Major Theories of Personality Disorder. New York City: Guilford Press; 2005.